It's snowflake season! Which means it's time to pull a Buddy the Elf and decorate the whole apartment with snowflakes and paperchains and sparkles! But seriously - I'm cutting out snowflakes as I write this. These photos and links inspired me so much! I hope you get excited about adding some lacy white Christmas cheer to your space with this collection of some of the best ways to decorate with snowflakes. It's therapeutic, it's relaxing, and the end results are absolutely gorgeous. So check out this snowflake inspiration! 3D Medallion Snowflakes. I love the three dimensional look of these professional-grade snowflakes. Tack 'em to the wall for a beautiful piece of art for the holidays! You could also tape them together flat for a fancy and easier-than-it-looks table topper. Snowflake Garland. Now take those 3D snowflakes you just made and string them together into a garland! How gorgeous would that be strung across a doorway or wall? It would make such a lovely party decoration too! Snowflake Hallway. 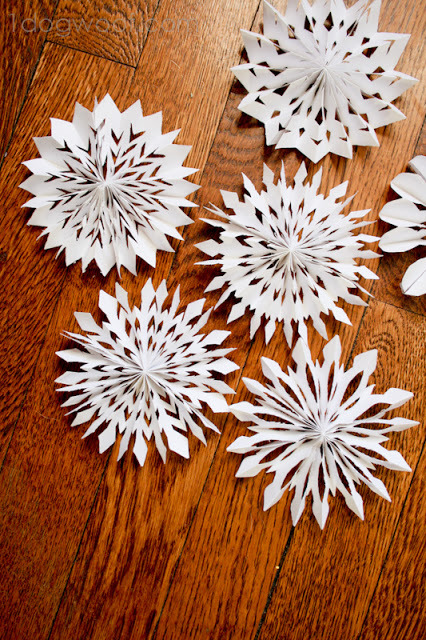 This mom cut out almost 50 snowflakes with her kids while watching Elf and Frozen (love it! 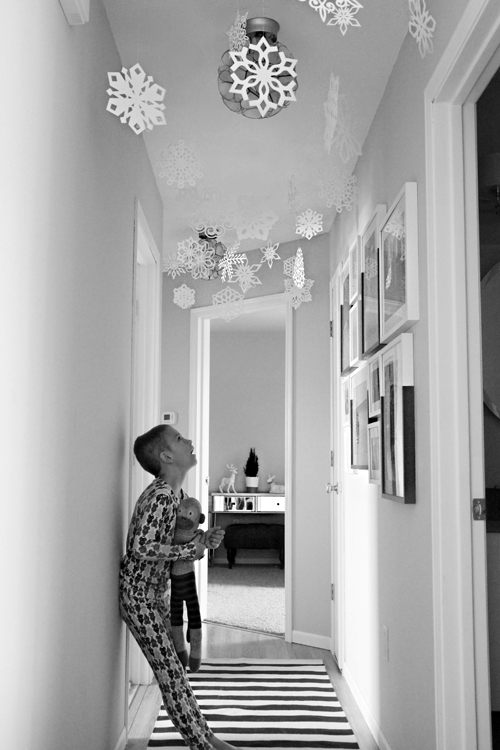 ), then surprised them the next morning with a magical hallway filled with giant lacy snowflakes! I can't wait to do that with my kids someday - so cute! Snowflake Door. Do you have a glass paneled doorway or window with square panes? 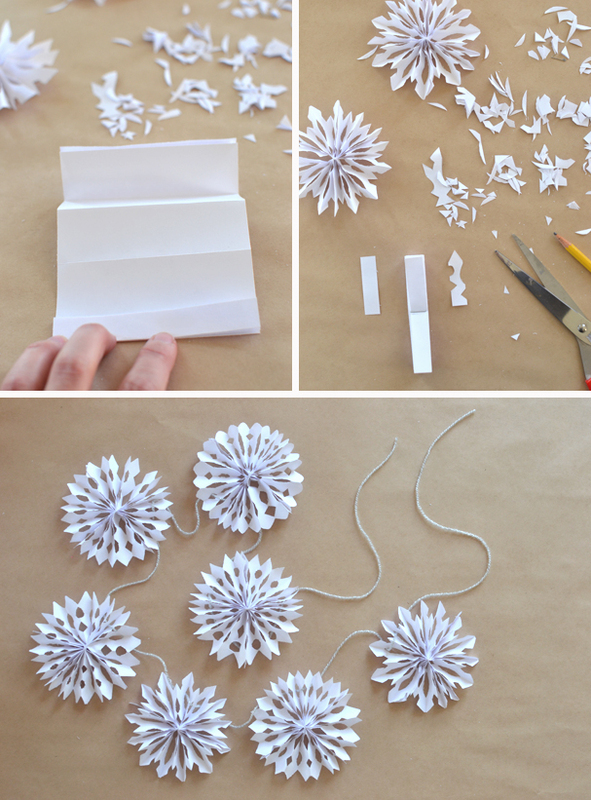 Try hanging a beautiful snowflake in each one for a sweet and old-fashioned homey look. So grab a stack of white paper (or newspaper, or magazines!) and start snipping! I hope these photos inspired you to create your own magical winter wonderland. I can't wait to hang up the snowflakes I'm making - I'll be sure to share photos over on Instagram. Happy crafting!